CNG: eAuction 431. FORGERY, Islands off Thrace. Samothrace. Circa 500-475 BC. 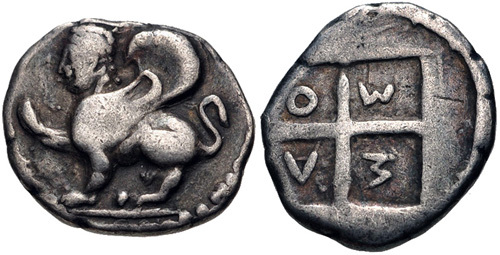 AR Hemidrachm (13.5mm, 1.95 g, 8h). Dies by Constantine Christodoulos, circa 1900-1914. 431, Lot: 642. Estimate $150. FORGERY, Islands off Thrace. Samothrace. Circa 500-475 BC. AR Hemidrachm (13.5mm, 1.95 g, 8h). Dies by Constantine Christodoulos, circa 1900-1914. Sphinx seated left, raising paw / Quadripartite incuse square with ethnic in quarters. Cf. SNG Ahsmolean 3638 (for original without ethnic); Svoronos, Christodoulos 54b. VF, toned.